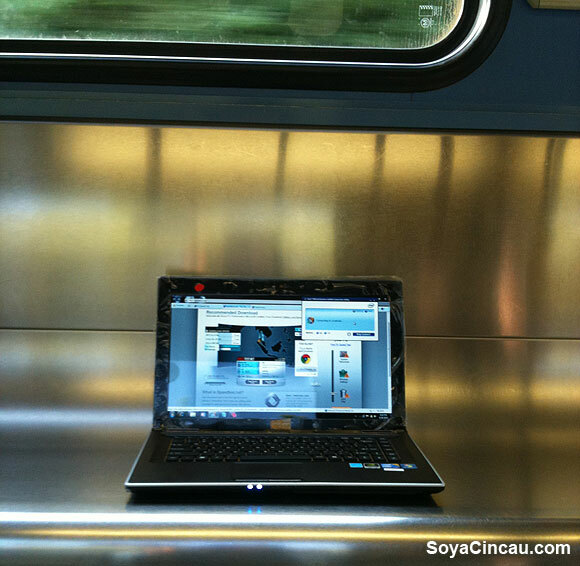 Laptops today are getting more demanding with users requiring both work and play on the go. With growing dependence on online application and services, connectivity has become a vital need. P1 is launching a new breed of laptops today with the Centrino Advanced-N + WiMAX 6250 embedded inside allowing users to connect to the Internet using WiMAX. P1 claims this new breed of WiMAX-Inside laptops offer the ease of use and flexibility of WiFi but with the performance and range advantages of WiMAX. To find out if this claim is real, we took a WiMAX-Inside laptop on a roadtest. Our roadtest covered ride on the LRT and also a drive drove around on some of KL’s busiest highways. Head on over to after the jump to see what we found out. For the first round, we took a 20KM LRT ride on the Ampang Line from Sentul to Sri Petaling station. While waiting for the train, getting onto the WiMAX network was easier than we thought. All we needed to do was switch on WiMAX using the WiMAX Connection Manager and we managed to get connected in less than a minute. It is indeed very much like connecting to WiFi. With WiMAX now activated and running, we tried testing it throughout the journey to find out what kind of speeds we can get and more importantly whether the device allows for seamless connectivity as well as see how the device responds to signal loss. Since WiMAX is considered as mobile technology, we expect the device to stay connected seamlessly as we moved around the P1 WiMAX network. Unfortunately, this is not the case. Along our route we experienced dropped connections when we switch between base stations. The problem is compounded by the fact that the computer didn’t come with a download manager to alleviate the problem. So whatever download we did prior we’re all interrupted requiring us to re-download all over again. The disconnection was so bad throughout the journey that we figured that we could only stay connected to one base station for approximately 500 metres before connectivity was lost. Another possibility of the frequent dropped connections could be due to the covered parts of our LRT route, this is a theory that we will try to prove in drive test section later. In the meantime, despite the inconvenience of having to reconnect and connect again numerous times, we continued with the test to find out what speeds were achievable along the Ampang Line. From the LRT test, only 9 out of 17 stations that we passed thru has good WiMAX coverage. Surprisingly the Sultan Ismail to Titiwangsa stretch gave us the best connection with speeds up to 6Mbps download but there were still disconnections in between. Test results as below with ratings indicating experience of web surfing and streaming videos. Some sites are connected but were so poor that we couldn’t even complete the P1 speed test. Next, we did a drive test from Penchala Link all the way to SS24 Taman Megah in Petaling Jaya on the LDP. On this route we found that trying to get connected to WiMAX difficult where we could only get connected for short periods while on the move. Is some areas like TTDI, Damansara Perdana, SS2 and SS24 connection was very patchy. Looking at the route vs P1’s coverage map we realised that the route is laden with blindspots with gaps aplenty. This brings us to the next test. Since the previous road test along LDP wasn’t a seamless one, we looked for a section of the P1 WiMAX network where there’s almost no blind spots. 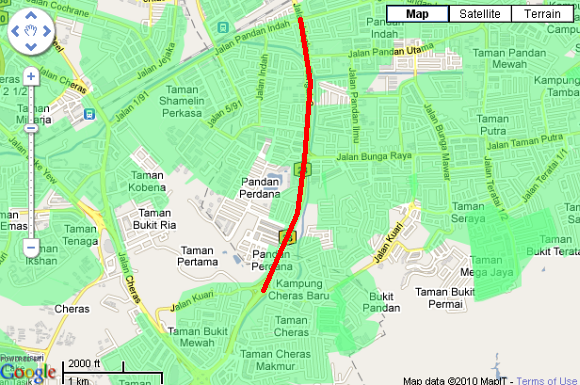 We identified MRR2 as the best P1 WiMAX coverage area where there’s full WiMAX coverage from Pandan Indah all the way to the big Jalan Cheras roundabout. As seen on the route map, and we expected to get seamless connectivity this time around. Halfway through along MRR2, we got disconnected and then reconnected again in the next couple of minutes. With frequent disconnection even in a full covered stretch like this one indicates that P1’s network doesn’t seem to support mobile handover between stations. We point our fingers to the network because in the spec sheet of the Intel Centrino chip, it indicates that the WiMAX module is able to support seamless connectivity. WiMAX enabled laptops are capable of delivering high speed internet that rivals ADSL service while having the ease of connecting to WiFi. However seamless handover between sites is not available at this point which badly affects the mobile internet experience. Another issue we faced is the glaring inconsistency of speeds in between adjacent coverage areas. We assume that the root cause of this is congestion, something that has been plaguing the P1 network for some time now. We’re suprise that the issue is still not completely resolved. Having said that, in areas where the network is good, blazing speeds are achievable, in fact we managed a maximum download speed of 6Mbps at some places while in other areas where we could get connected, we got very poor performance well below 500kbps. In some cases, we couldn’t even load up speedtest. So what’s our take on this? When working on the go, speed is important but its not the only critical factor. What matters most is the ability to stay connected virtually anywhere seamlessly while maintaining a consistent speed. This is something the network, not the device, can’t deliver at the moment. At the present moment, P1 is the most progressive WiMAX operator in Malaysia with the largest coverage. However its coverage is far from what the 3G service providers can offer at the moment and still needs to be improved considerably. They really need to look into the speedy implementation of seamless switching between base stations if they plan to be a true mobile player.The promise of being connected while on the move is something P1 is not able to deliver at the moment so if you’re looking to stay connected while travelling, this solution is not for you. Despite the shortfalls, we view this latest development as a usable WiFi alternative. As we’ve mentioned earlier, P1 markets the WiMAX-Inside laptops as offering a better range and performance then WiFi. If used in the same manner (that is, surfing the internet outdoors while stationary) then the product functions as indicated. Getting connected to WiMAX was a breeze, definitely as easy as WiFi and when you’re in the right place, you do get good speeds beyond what 3G can deliver. 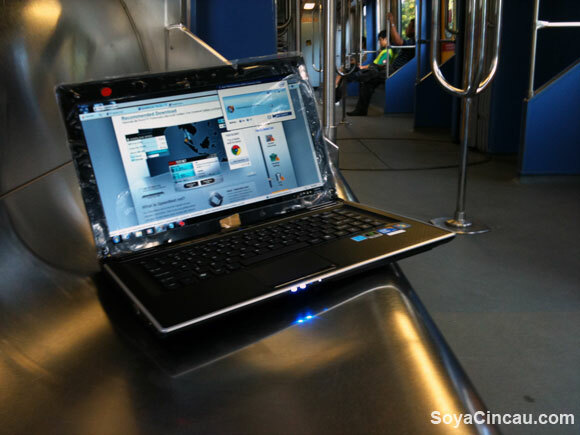 So is the P1 WiMAX-Inside laptop for you? If the laptops are priced very competitively against non-WiMAX laptops then we would opt for the WiMAX laptops just to have the flexibility. If you’re the type of user who mostly surf outdoors while being stationary, then this is something you can look into. But if you require connectivity while being on the move, you’ll have to look elsewhere to get connected. Tomorrow will be the official launch for P1 and Intel’s WiMAX embedded laptops where the packages will be made publicly available. Don’t forget to check back here for the latest updates as we bring you the latest. Next, we compare the WiMAX embedded laptop with P1 WiGGY USB WiMAX modem. Which one is better? Watch this space in the next couple of days to find out.